This week we’re looking at composition in sculpture. Like a painting, a sculpture is arranged or ‘put together’, but where sculptural composition differs from a 2D picture surface is that it can be seen in the round, from all angles. Not easy, in short. Let’s see how two masters measure up. 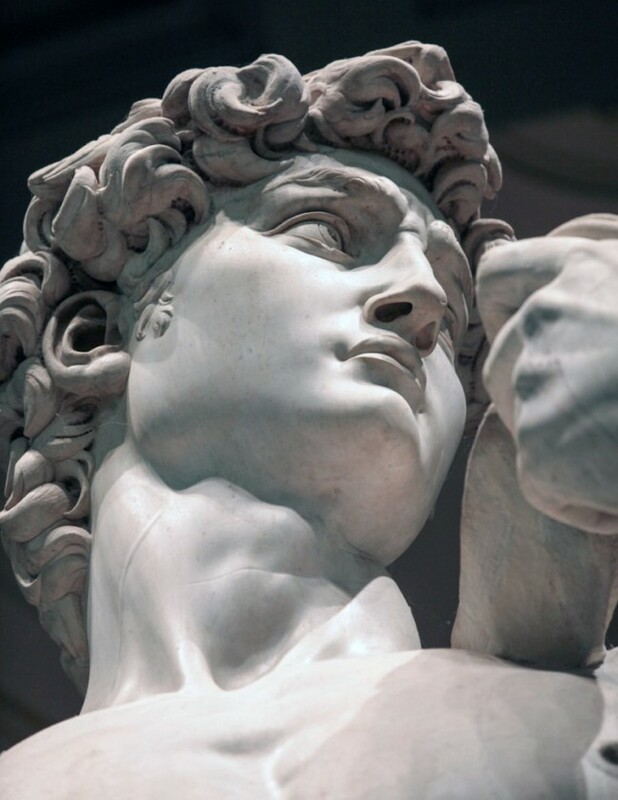 Michelangelo’s David. Familiar. Iconic. 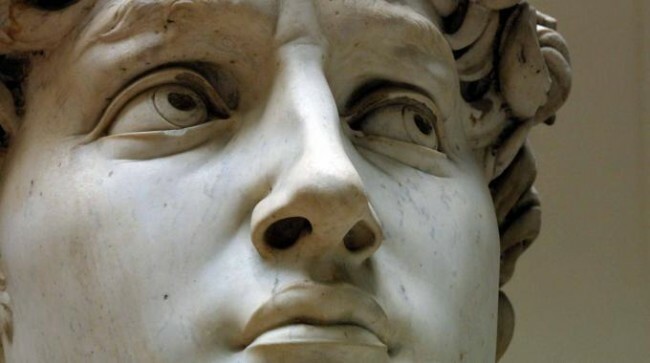 Commissioned in 1501 by the board of works of Florence Cathedral it is almost 3 times the size of your average Joe. In the Old Testament David is the young boy who takes on the giant Goliath on behalf of the Israelites. With only a stone (in the right hand), sling-shot (on the left shoulder) and a little help from God, he prevails. It is Michelangelo’s composition of this huge figure that characterises his hero and provides his personal spin on the narrative. 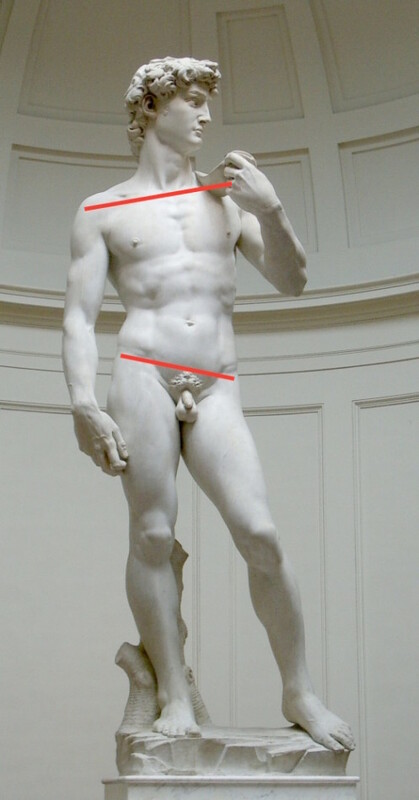 Contrapposto. It’s an Italian word referring to the pose of the human body when it is relaxed and standing. 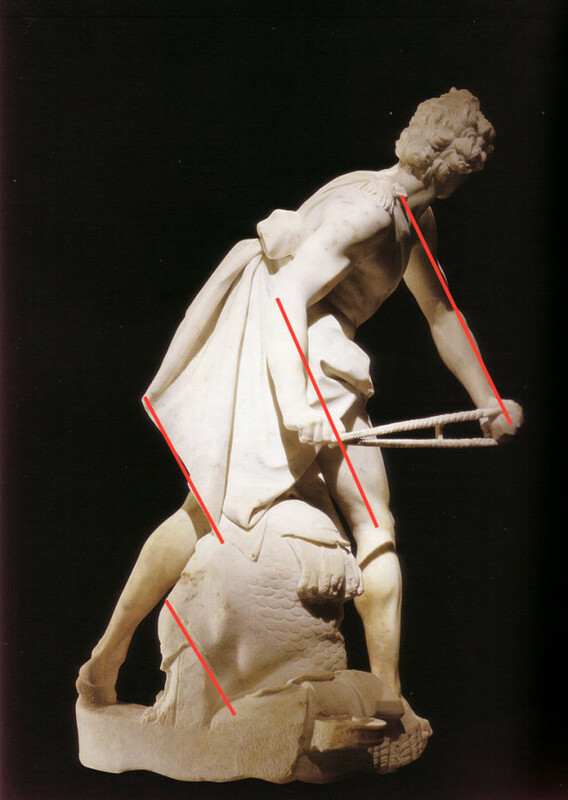 Weight is put on one leg and is taken off the other, creating one axis line through the hips that is in opposition to an axis line through the shoulders. Contrapposto creates a sense of sway and incipient movement in a figure. David’s pose tells us he is composed and concentrated. His head – turned to the left – suggests he’s just caught sight of the giant. The right side of his torso is contracted by his pose while the left is elongated, expressing the concept of an open and vulnerable passive side as opposed to closely defended active side. Indeed his right hand (on the compressed ‘active’ side) is just beginning to tense. Check those veins. 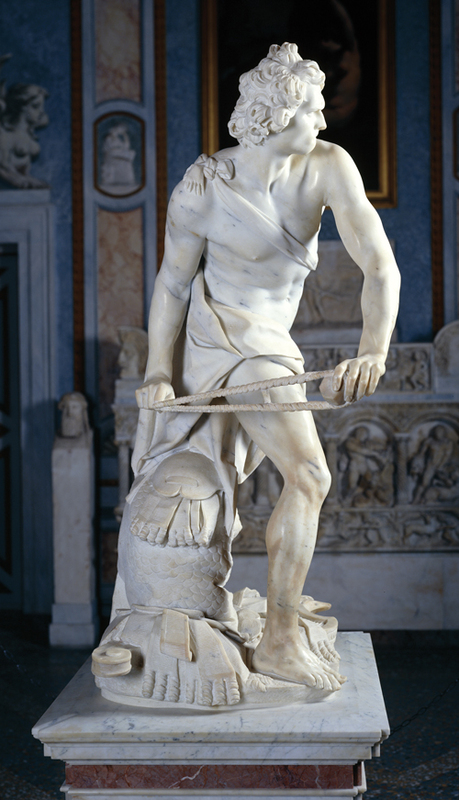 When Gian Lorenzo Bernini (1598-1680) took on David in 1623 he had big shoes to fill. Made in just 7 months his life-size take on the Old Testament hero breaks new ground, rippling with his signature bravado and intensity. 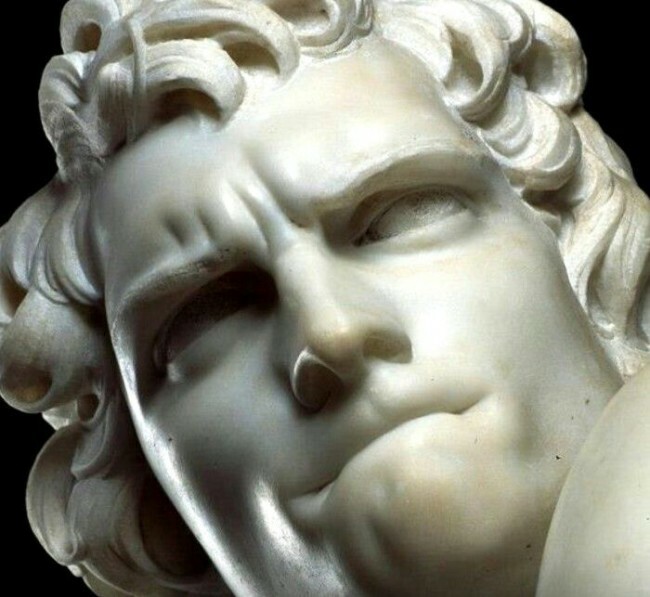 If Michelangelo’s David presents a harmonious figure arranged around a contrapposto pose and best seen from a frontal viewpoint, then Bernini does a complete 180. His David is 3D proper and by that I mean begging to be seen from all angles, in motion. David’s torso rotates and he leans back: his limbs stretch out. Nothing is in repose and as you move around there’s no clean silhouette as in Michelangelo, rather a series of dynamic lines in front of your face. Most emphatic are the diagonals, present in almost all views, giving a sense of dynamism and rhythm. 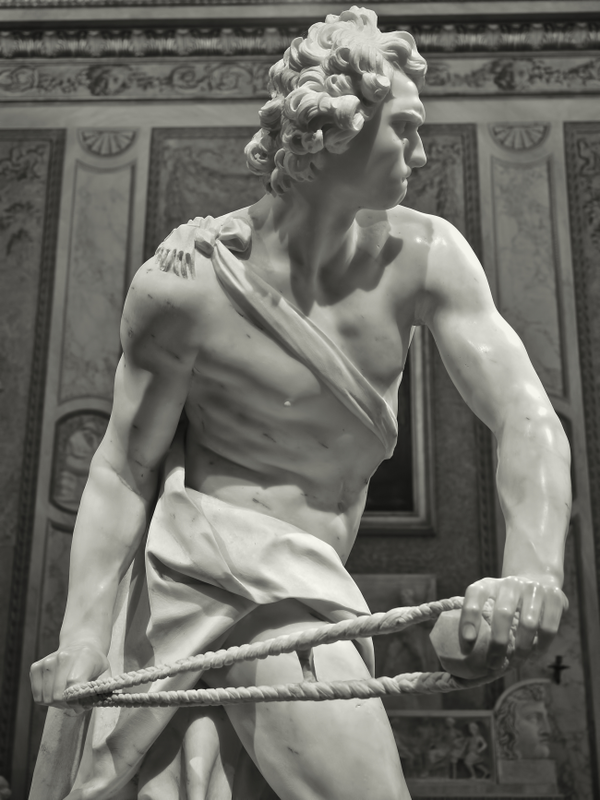 Bernini’s composition engages his David with his surroundings. We’re implicated too, moving in the conceptual space of the battle between boy and giant. 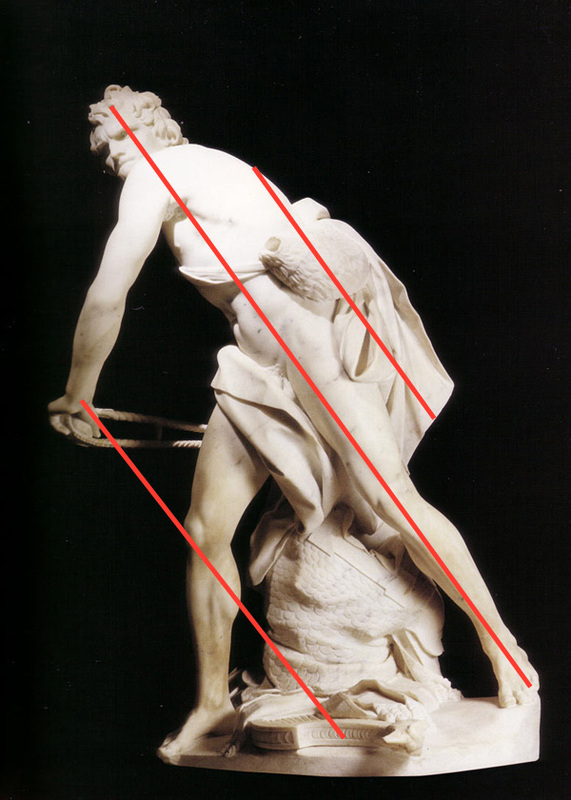 Bernini’s composition makes an exhilarating meal of the moment he’s chosen to depict: not the pre-battle focus session as seen in Michelangelo but the split-second before the stone explodes from the sling. 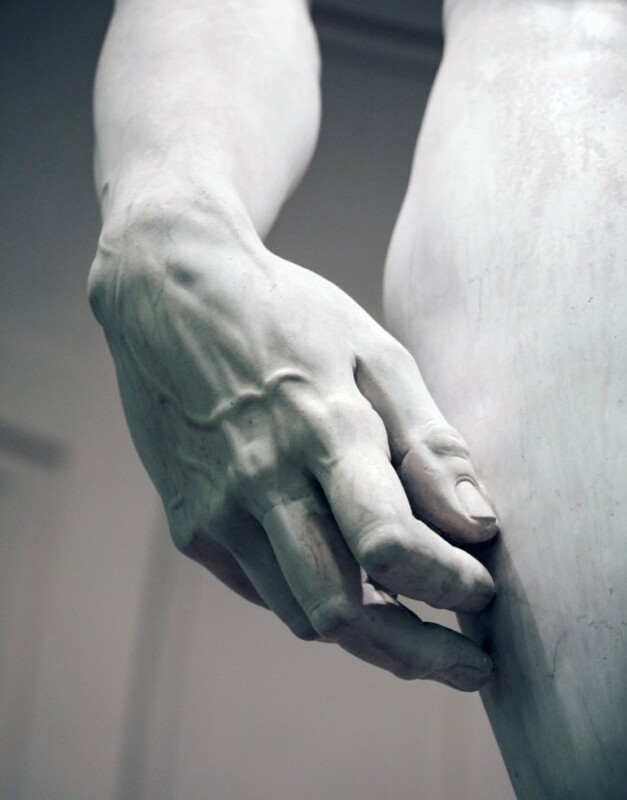 The latent force that characterises Michelangelo’s David is here on the cusp of being released. Two distinctive takes on the same subject proving that the battle begins and ends with composition.